Learning Objective: State the operating principles, identify the components, and maintenance procedures of an automatic transmission. 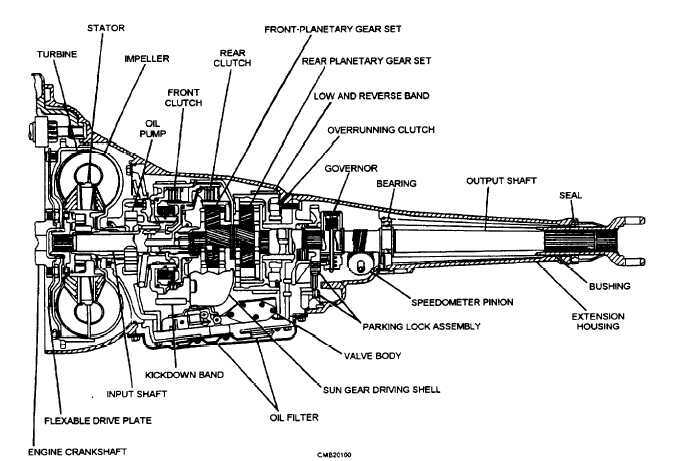 The automatic transmission (fig. 4-23), like the manual transmission, is designed to match the load requirements of the vehicle to the power and speed range of the engine. The automatic transmission, however, does this automatically depending on throttle position, vehicle speed, and the position of the control lever. Automatic transmissions are built in models that have two-, three-, or four-forward speeds and in some that are equipped with overdrive. Operator control is limited to the selection of the gear range by moving a control lever. The automatic transmission is coupled to the engine through a torque converter. The torque converter is used with an automatic transmission, because it does not have to be manually disengaged by the operator each time the vehicle is stopped. Because the automatic transmission shifts without any inter- ruption of engine torque application, the cushioning effect of the fluid coupling within the torque converter is desirable. Because the automatic transmission shifts gear ratios independent of the operator, it must do so without the operator releasing the throttle. The automatic transmission does this by using planetary gearsets whose elements are locked and released in various combinations that produce the required forward and reverse gear ratios. The locking of the planetary gearset elements is done through the use of hydraulically actuated multiple-disc clutches and brake bands. The valve body controls the hydraulic pressure that actuates these locking devices. The valve body can be thought of as a hydraulic computer that receives signals that indicate vehicle speed, throttle position, and gearset lever position. Based on this information, the valve body sends hydraulic pressure to the correct locking devices. Torque converter - fluid coupling that connects and disconnects the engine and transmission. Figure 4-23. - Automatic transmission cross-sectional view.